It seems that humans are utterly incorrigible in our attempts to foresee what the future will bring. It seems there’s nothing we haven’t tried to read significance into, from the flight of birds to the dregs at the bottom of the teacup. I myself in junior high devised a method of telling the future by noting the location of the white spots that sometimes appeared on my fingernails. I daresay it was about as accurate as any of the other divination methods out there, which is to say no more so than random chance. 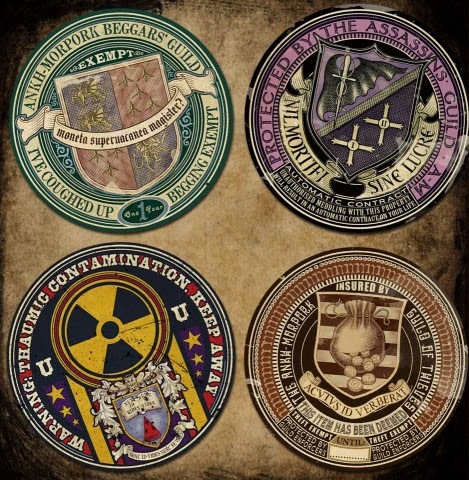 But it was amusing to pretend that I could somehow predict future events, and humans certainly do love to read meaning into every conceivable pattern we see. 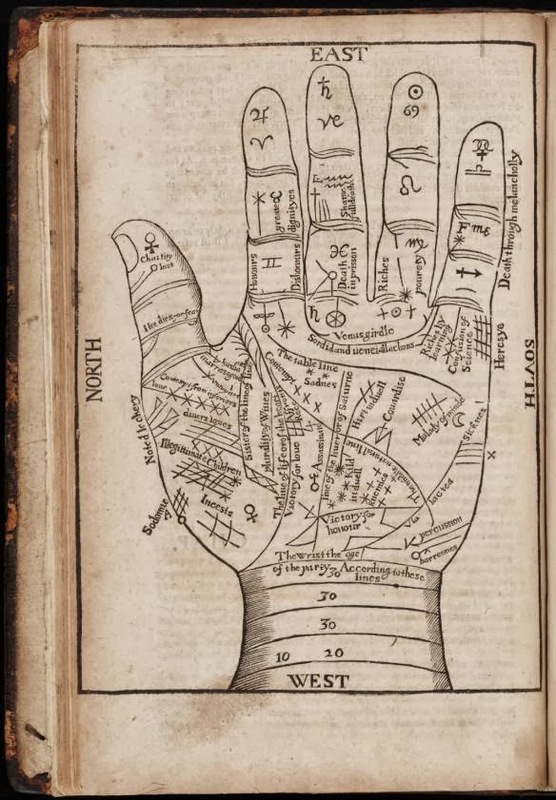 So this month I’ve collected for your delectation a very small sampling of some of the wackier and more interesting words for methods of divination. Most of these words have Greek roots, and most arrived in English during the late middle ages or renaissance. Unfortunately most of them are also sufficiently obscure as not to show up in many dictionaries (plus many of them have multiple spellings), so I wasn’t able to track down as much information about them as I would have liked. Still, they’d be great words with which to impress your friends - especially if you actually managed to use any to foretell the future. But please remember that some of these words are definitely not to be tried at home. The behavior and anatomy of humans is also very useful to the diviner. When it comes right down to it, anything that makes a pattern is fair game. An excellent everyday method of divination is to pick random passages from a text. aleuromancy - divination involving flour, but more importantly also involving dough and messages therein, thus making this the word for telling the future from fortune cookies. Too bad fortune cookies almost never provide actual fortunes! cromniomancy - the sprouting of onions. There are various ways to do this, but generally you write possible alternatives on a selection of onions and see which one sprouts first. dracomancy - dragons. I’m intrigued. Do you observe the flight of dragons, or do you have to slice them open and examine their livers? Where do you find these dragons in the first place? And really, it hardly seems much advantage, since it’s just as hard to find the dragons as it is to know the future without them. moromancy - foolishness. I don’t know how you’re supposed to use foolishness to tell the future, but I can’t help thinking this word really sums up the whole fortune-telling thing with a certain ironic neatness. 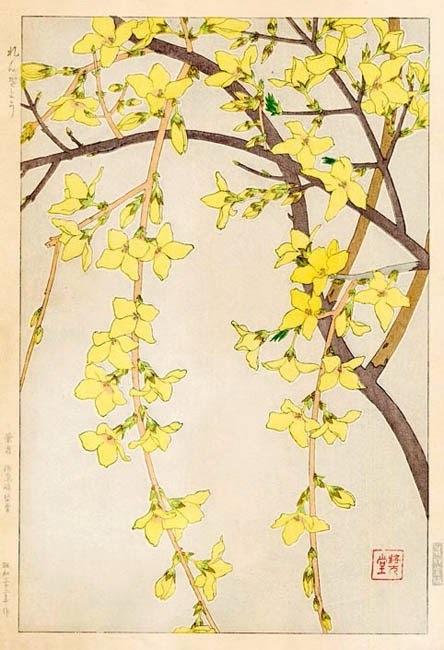 Every year at the beginning of January when I dump out my bouquets of evergreens, pine cones, and red berries, I fill the vases with the cold, bare sticks of forsythia. A few weeks later, in the dull and frigid tail of January when it seems that all there is to look forward to is the dull and frigid expanse of February, I suddenly have a sunny, yellow promise of spring. First one bright, slender bud springs open, then another, and then the stems are covered with blooms, petals flung open in graceful exuberance. Forsythia flowers aren’t really a particularly interesting form, nor do they have any pattern or texture. All they have is that happy yellow. So yeah, I know I always say how much I like black and white, but with forsythia, it’s gotta be yellow. color wood block prints of flowers, the Japanese printmakers are the obvious first stop. Like my January forsythia, these flaunt their yellow in an essentially colorless space; they provide all the color in the world. 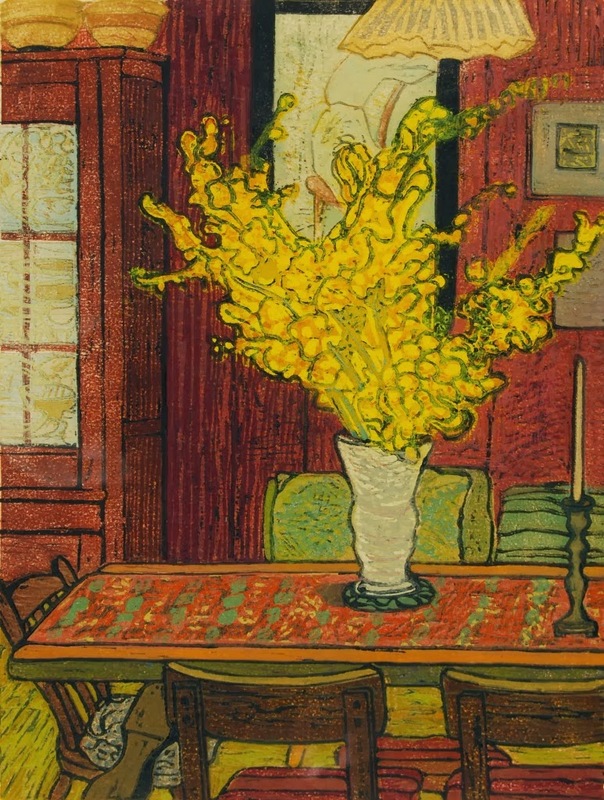 The second piece here, by contrast, places the flowers inside in a vase, just as mine actually are, but without such a wintry feeling. I’m not sure what technique Kirchmeier used - multiple blocks, or perhaps one block with multiple colors plus a black-inked key block. 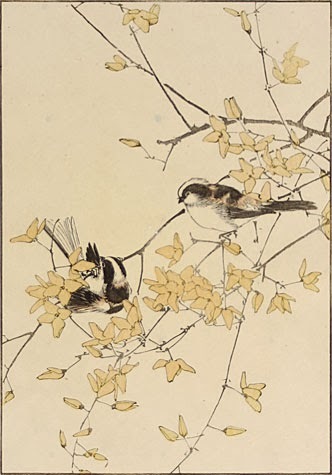 Shodo and Keinen used the traditional Japanese printmaking techniques of multiple blocks with multiple colors on each, inked with watercolor washes. I hope these flowers bring you a smile today! This weekend was the Arisia sci fi/fantasy/fandom convention in Boston, and my third time attending. As before, I had a display of my block prints in the art show, I enjoyed seeing peoples’ costumes, I attended lots of panels mostly about issues of reading and writing speculative fiction, and I came away with lots to think about. I had hoped to have a more cohesive response for today’s blog post, but instead I’m just going to share a few unrelated quotations from panelists. “Do-gooders are boring.” Yup, this opinion again, stated by a panelist on the topic of spirituality in sci fi/fantasy, and how he loves Greek mythology because the gods are so flawed. Whether this is actually the majority opinion I can’t say, and if it is, by how great a majority the “good is boring” camp predominates I don’t know either. All I can say is that I hold a different opinion that I wish would be acknowledged more often. Here’s my previous discussion of my love for good good guys. Not a quotation, but a final unrelated comment: one of my favorite moments of the entire weekend was a belly dancing dalek. 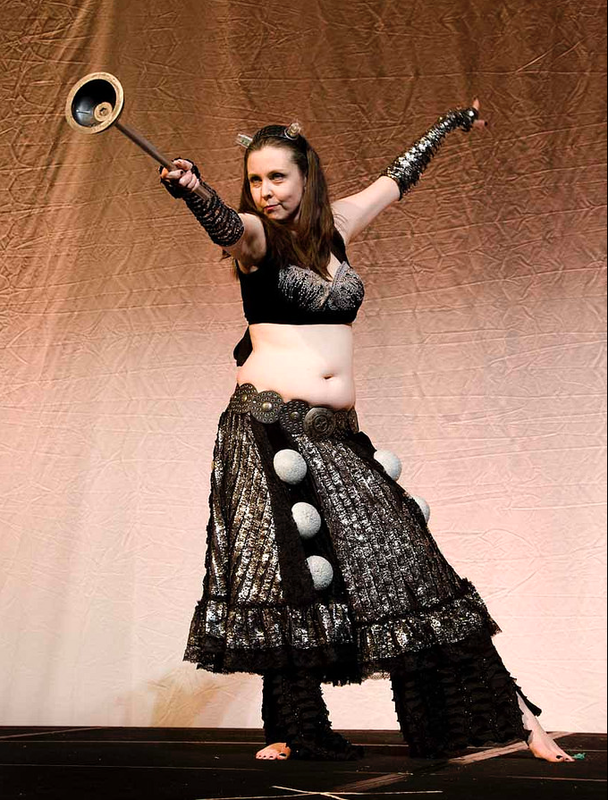 She imagined and made an awesome belly-baring dalek costume involving various black and silver fabrics, styrofoam balls, and a silver and black toilet plunger. She performed her dalek dance to this mash-up of the Doctor Who theme and a Green Day song, “Dr Who on Holiday.” It’s exactly this sort of creativity, enthusiasm, and sense of humor that I think is the best of fandom and what makes Arisia so much fun. I’m happy to report that my sales in the art show were fantastic this year, and D was so pleased that he signed us up on the spot for Arisia 2015. So… I’ll be back! Today is Benjamin Franklin’s birthday, and, as previously mentioned, I’ve had Franklin much on my mind in the past year as he’s featured in my new middle grade fantasy. You can see my post on Franklin’s magical abilities here. But of course Benjamin Franklin fits into this blog’s other theme, too, being a printer. 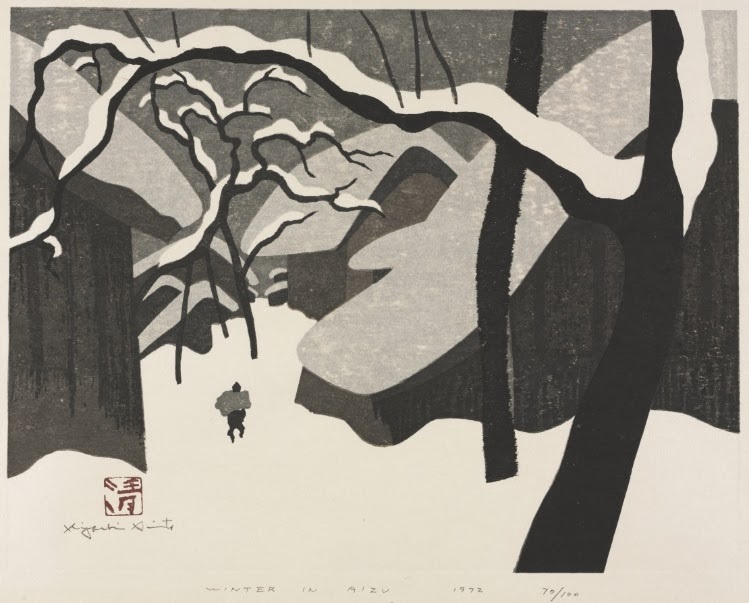 It’s unclear whether he ever did any printmaking - that is, designing and carving images as opposed to composing lines of type. Probably he would have left that to others trained in the art, although certainly he was the type who liked to try his hand at everything, training or no training. In any case, he doesn’t seem to have had any particular interest in the artistic side of printing, but he was undoubtedly a man who spent a lot of time inking and pressing. Even when he was a respected scientist and a famous statesmen, he still always considered himself a printer. 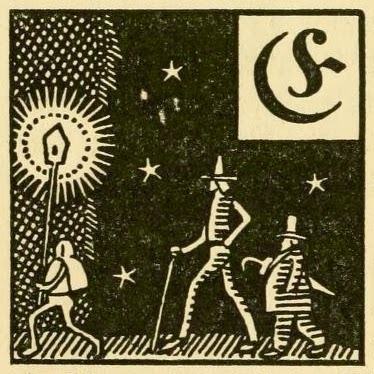 I came across this series of woodcut illustrations of Benjamin Franklin’s life, so I thought I’d share them. 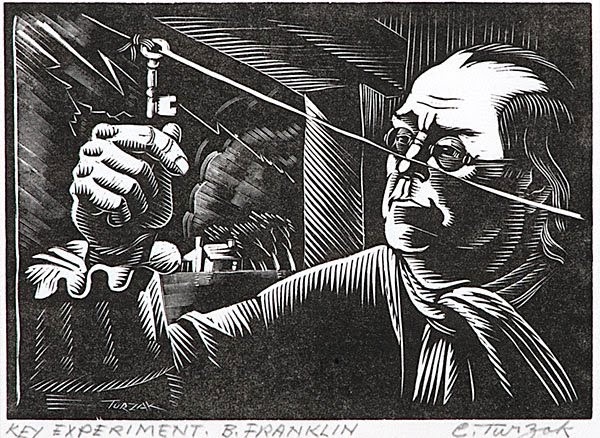 Charles Turzak (USA 1899-1985) began as a woodcarver, but eventually went to art school, worked for the WPA, and became famous for images of Chicago and woodcut histories, including a biography of Franklin. 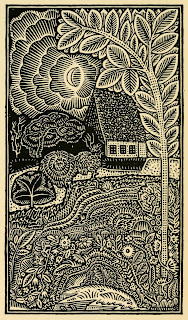 I think these wood block prints are notable for their large proportion of black. It tends to make them look quite dramatic, which is especially fitting for the scenes of storm and discovery. I find the sky especially interesting in the view of Franklin’s birthplace - half the sky is black and half white, based purely on artistic composition, rather than corresponding with anything in the real world. It balances the white and black walls of the house and makes a better picture than either an all-white sky or an all-black sky. Benjamin Franklin would be 308 years old today, and he’s still going strong! 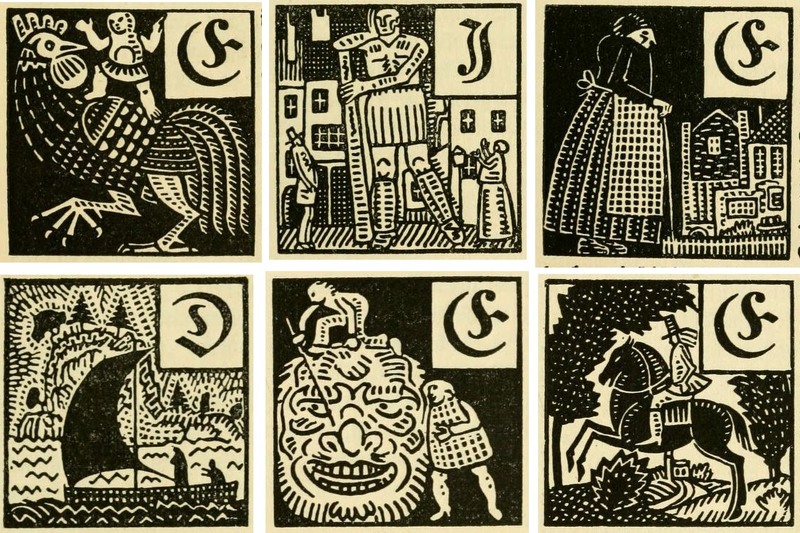 Here are some charming little woodcut illustrations from a 1919 German book of fairy tales. Unfortunately I can’t find any indication of the artist who made these miniature illustrations, but I like his (or possibly her) style. 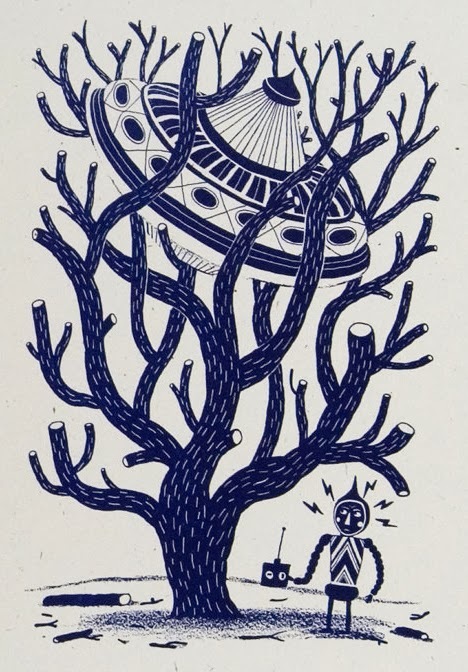 All the doodley lines and patterns are fun to look at, the characters are quirky, their situations whimsical. weren’t designed for each story individually, so for all I know they weren’t even made for this book. Perhaps the printer simply reused blocks already in his collection, which would explain the lack of credit given to an illustrator. But in any case, I liked looking at them and I’ve picked out my favorites to share with you. Of course I’ve given preference to those with a fantasy element: giants and dwarves, monsters and heroes, and other mysterious goings-on. I’ve also given preference to those with pleasing patterns or contrast and visual appeal. on black, and some charming whimsical details. 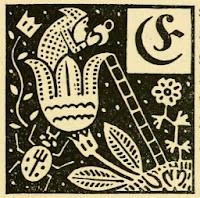 (I think my favorite detail is the ladder leading up to the flower in which the tiny dwarf sips his tea.) They go to show that it doesn’t take a grand gesture to make an impact, and that even the smallest dose of art can brighten up the day. 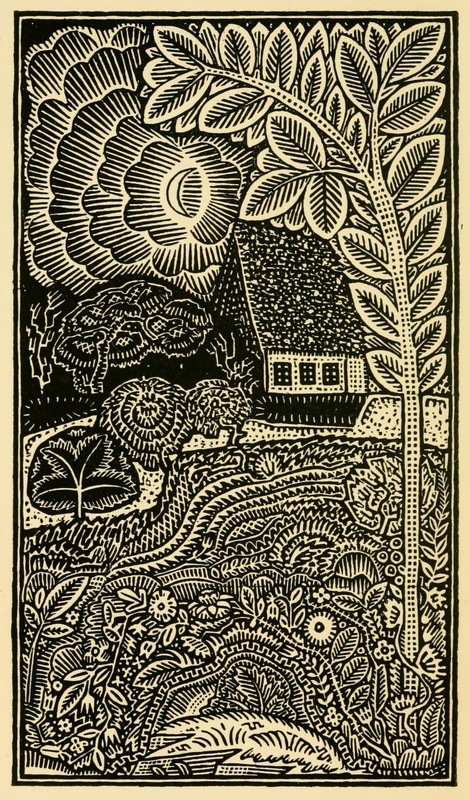 Fronstpiece, woodcut, all from Deutsche Märchen seit Grimm (German Folktales since Grimm) set forth by Paul Zaunert, 1919. Here’s another artist I can’t find much about, but whose work pleases me greatly. (Yet more confirmation that good art and art world fame are not synonymous.) 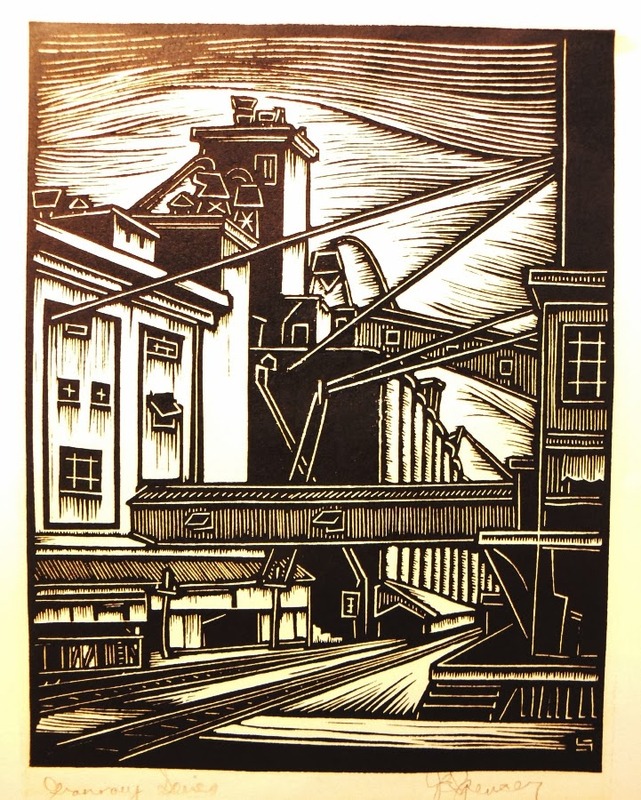 What I can discover about Jim Edd Spencer (c. 1905-1944) is that he was from Kansas City , and his primary work consisted of linoleum block prints of Kansas City and Independence, Missouri. 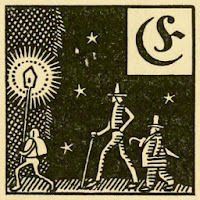 The Kansas City Public Library apparently has a collection of his work, but it isn’t digitized for me to look at on-line, much to my disappointment. The few pieces of his that I did come across I like very much. 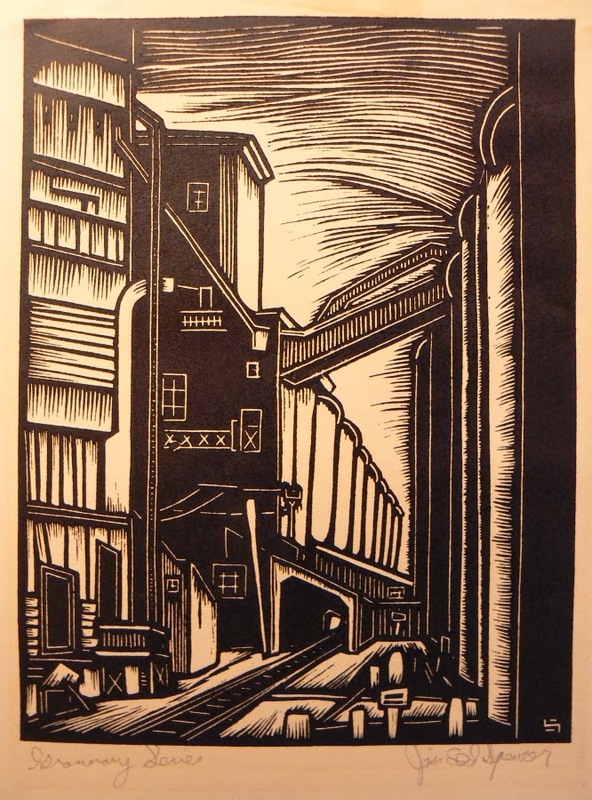 Here are two pieces from a series on granaries that apparently had at least 11 prints. I like the mix of black and white and texture; I like the swooping lines of the sky behind the straighter lines of the architecture; I like the mix of black outlines and white outlines; I like the slightly whimsical quality to the shapes that I’d expect to be stark and severe. 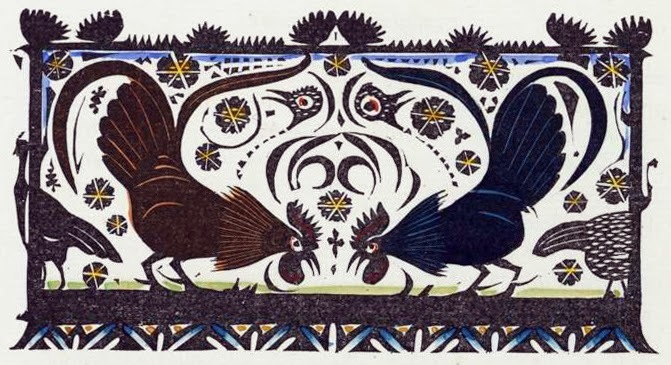 You can see that Spencer fits into that Depression-era style in which so many artists created block prints between the two world wars, but Jim Edd Spencer definitely has his own, charming style to contribute and I wish more of his work were in the public eye. Perhaps he never made very much -- after all, he died pretty young. Still, he’s another artist who deserves more appreciation. January 3 was J.R.R. Tolkien’s birthday, and I was going to use it as the opportunity to write my review of Part II of “The Hobbit” movie. But I find that all I can say about that movie is, “What in the name of all the Ainur is Peter Jackson playing at?” Another critic apparently called it Jackson’s fan fic, and I think that sums it up. It’s excellent fan fiction - quite enjoyable, and with some elements that appeal to me very much - but it’s really not Tolkien’s story any more. Like much fan fiction, it’s got some bits that I think a lot of fans will get a kick out of contemplating, but, like much fan fiction, it ranges in places from the slightly silly to the wildly ridiculous. Fan authors seldom work as hard as the original author at logic, cohesive narrative, plausibility, or laws of science and nature. Jackson certainly hasn’t. It illustrates the same sort of attitude toward the wonders of Faery that Sam Gamgee feels toward the elves. It emphasizes the perilous power of Faery, as opposed to mere prettiness. I’m not crazy about the illustrations, which somehow manage to look very 60’s despite their medieval style, but I like this one of Smith and his family. In any case, Smith of Wootton Major is an interesting read reflecting a more traditional (as in medieval) view of Faery, tempered through a more modern romanticism. vigor of this scene when most other snowscapes seem to capture the stillness of snow instead. 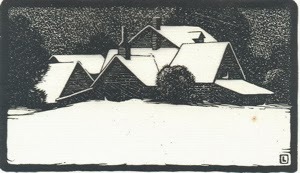 For example, Herschel Logan’s scene of snowfall at night seems quieter and more peaceful. It’s the soft white blanket, not the blustering blizzard. One of Logan’s trademarks is the powdery look of many many little carved nicks that are hardly more than specks. It’s very well suited to the silent, sifting snow. Kiyoshi Saito’s snow looks much heavier than Logan’s - or ours. 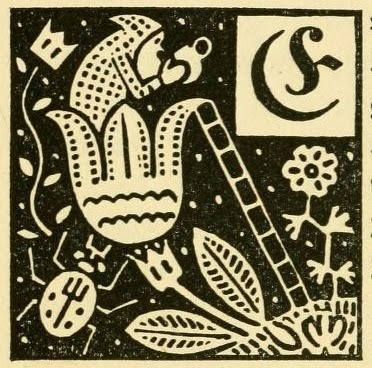 It’s actually a color woodblock print, although the colors are only shades of grey. I think I can make out six colors of ink from black to the lightest grey, plus white. It seems such a simple image, with its large, rounded areas of untextured ink, but in fact it’s quite complex. Sort of like snow itself, really - which may be awesomely complex with every unique snowflake and all, but always has the effect of simplifying every shape and color. 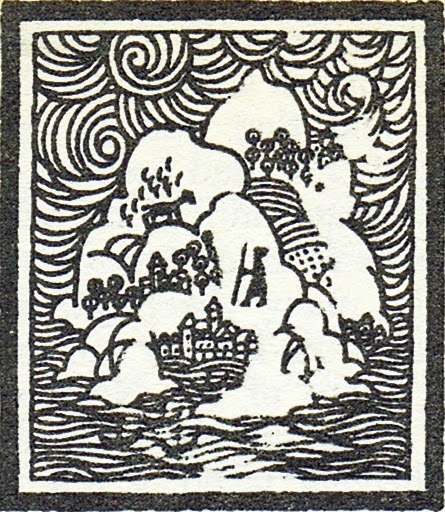 Saito’s snow looks like it might be excellent for packing, and so, evidently, is the snow in Olaus Magnus’s depiction of “the Youths’ Snow Castles.” What an elaborate fort this is! P went up the street this morning and tried building a snow fort with a friend, but theirs wasn’t even in the same universe as this, with its high battlements and tunnel entrances. It looks to be decorated all around with icicles, too, which seems a remarkably artistic touch for a bunch a boys intent on a snowball fight. But our snow is shovelled, and the sun is out, and the only reasonable thing to do now is to get a mug of hot tea and curl up in a blanket with a good book.